Description: Perennial herb native to Brazil. The only common food plant in the Bromeliaceae. Cultivated commercially in the tropics and parts of the subtropics of the Old and New Worlds, with Hawaii producing one-third of the worlds crop. First domesticated by the Guarani Indians in what is now northern Paraguay before the arrival of the Spanish. 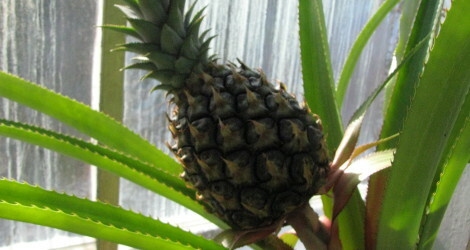 Unlike other edible plants from the new world, the pineapple was quickly accepted by the Europeans. 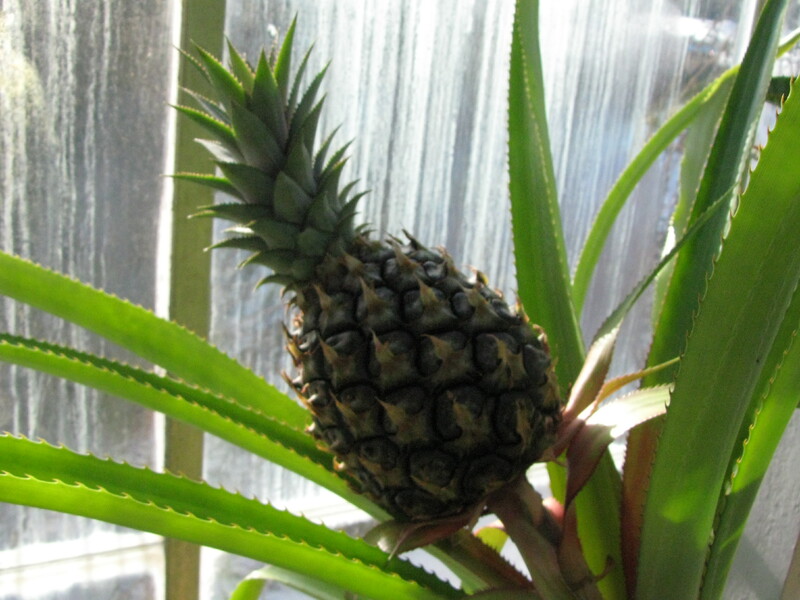 The pineapple itself is a multiple fruit formed by the partial fusion of numerous fleshy segments from several separate flowers in which the hardened sepals from a continuous rind over the outside. The fruit is normally seedless due to self incompatibility and the use of Triploid cultivars. The major portion of the pineapple crop is canned. They are also eaten raw, dried, in confectionaries and a juice is extracted. Cores have been made into candles. The juice is the source of denatured alcohol and an alcoholic beverage, 'Vin d' Ananas'. Pressed peels and cores are used as food for livestock. Pineapple waste is made into vinegar. Leaves are a source of a hard fiber called 'Pina Fibre'. The fruit which must be ripened on the plant contains about 15 percent sugar plus fruit acids, vitamins and minerals. There are many different varieties cultivated. Uses: Medicinal: Contains Bromelain, which acts as an anti-inflammatory and proteolytic. WCSP (2016). World Checklist of Selected Plant Families. Facilitated by the Royal Botanic Gardens, Kew. Last accessed on Friday, July 21, 2017. 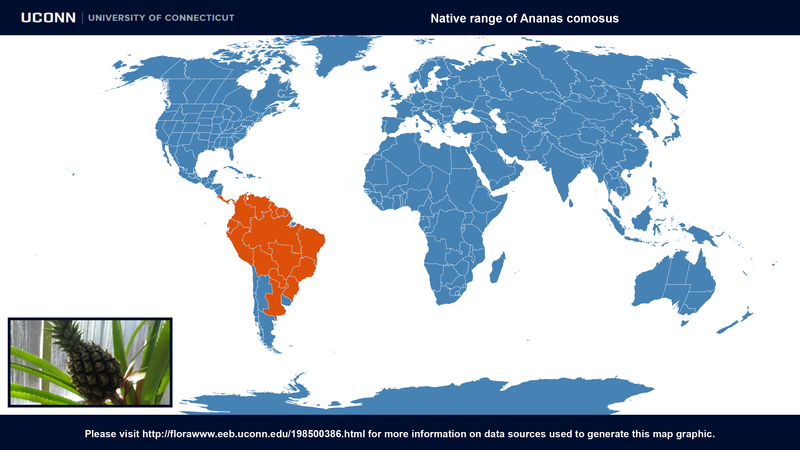 Ananas comosus at Global Biodiversity Information Facility. Last accessed on Friday, July 21, 2017.